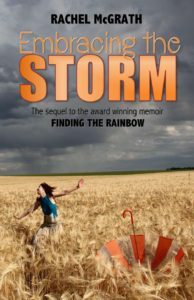 Embracing the Storm, is my current story, my journal entries following multiple miscarriages, fighting against my infertility and always moving forward. The storm still thundered overhead, but I was determined not to let it beat me down. After every storm we search for a rainbow of hope. This is my ongoing fight against the storm, to reach my rainbow.